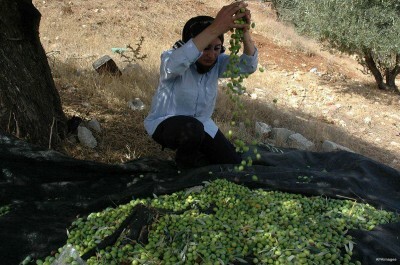 Israeli settlers stole the harvest of 400 olive trees planted on private Palestinian land, farmers in Nablus reported yesterday. Ghassan Daghlas, a Palestinian official who monitors settlement activities in the northern West Bank, told Ma’an that more than 30 Palestinian families from the Nablus district village of Deir Sharaf entered their agricultural lands yesterday after being banned since Friday by Israeli authorities. However, due to illegal settlement expansion, land confiscation, mobility restrictions due to Israel’s Separation Wall, and various permit laws, Palestinian farmers are often unable to access their land and the number of olive trees is dwindling. This year’s olive harvest season, which began early last month, has already witnessed attacks by Israeli settlers and Israeli government restrictions on Palestinian farmers and their lands. The Palestinian government has no jurisdiction over Israelis in the West Bank, and violent acts carried out by Israeli settlers go unpunished. Israeli human rights groups Yesh Din and B’Tselem have previously condemned Israeli authorities for failing to protect Palestinians from settler violence or to investigate attacks, particularly during olive harvest season when incidents of attacks occur on an almost daily basis.